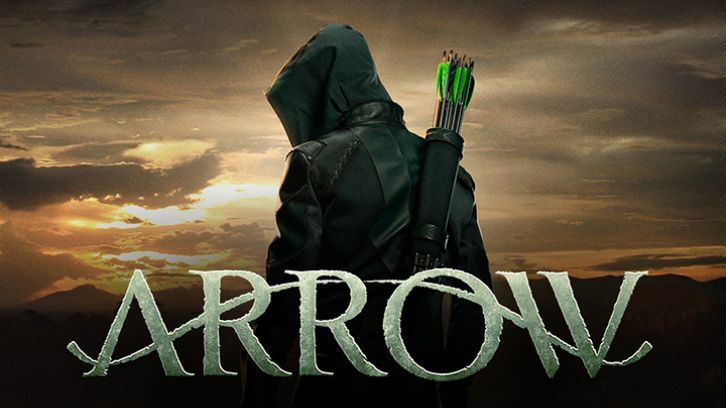 Arrow returned after a long hiatus with “My Name is Emiko Queen” written by the team of Benjamin Raab and Deric A Hughes and directed by Andi Armaganian. The episode was hugely disappointing to someone who has watched this show from the first episode. I do NOT want Emiko Queen – I want Oliver Queen. I don’t need the entire series as a do over with a female protagonist. The fact that Sea Shimooka is a terrible actor doesn’t help. Even worse? We get maybe five minutes of screen time with Stephen Amell? What. Has. Happened. To. This. Show? Beth Swartz? You have failed this series. The entire Emiko storyline is simply a retelling of Oliver’s story – with Rene (Rick Gonzalez) subbing in for Diggle (David Ramsey) as side-kick and Curtis (Echo Kellum) subbing in for Felicity (Emily Bett Rickards). She even has to get shot before she’ll reach out to get help! Shimooka has the physical ability for the stunts and work out shots – but that’s it. And the plot holes associated with this storyline??? Her mother was killed a year ago – Emiko grew up in the glades and started down her path of revenge with her mother’s death. 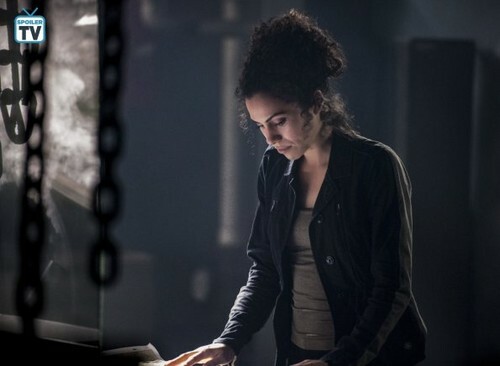 So in one year, she has learned super-sleuthing abilities and the fighting techniques it took Oliver five years to master. At least in the comics, her abilities made sense because her mother was Shado! Oliver starts his new job as Dinah’s (Juliana Harkavy) new side kick. He’s treated like an idiot at the scene. It also completely breaks the chain of evidence for him to walk off with the evidence – so forget about a conviction. He takes it to Felicity, who discovers the DNA belongs to his half sister. Further investigation leads them to a letter written by Robert to Walter Steele revealing his secret family in the Glades. Felicity and Oliver also realize that Moira was behind Emiko and her mother being abandoned after Robert’s death. I did like the scene between Oliver and Felicity on the balcony as Felicity tries to convince an overwhelmed Oliver to reach out to his new half-sister. Rickards had even less to do in this episode than Amell! Rickards and Amell are both excellent in the scene – which only makes the more lackluster performances worse – and underscores why these two are the stars. 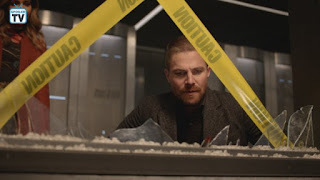 In the end, Felicity convinces him that Emiko running around pretending to be him is a cry for help if ever there was one, and the episode ends with him confronting her at their father’s grave. The future storyline continues to annoy – but the plot and the absolutely dreadful aging makeup. It was fun to see Rene as Mayor of the Glades, however. One question though – what happened to Rene’s scar??? And I will concede that the scene between Gonzalez and Harkavy was actually good work from both of them. She does convince him to give her the “Archer” program after reminding him with the tattoo that they along with Roy, Diggle, Oliver and Felicity made a promise to each other. So what about Curtis and Laurel? I also do like Andrea Sixtos as the adult Zoe. Too bad they didn’t get her to play Emiko. It would also seem that Rene has become a bad guy – or at least one who is easily duped as his right hand guy seems to be behind the plot to blow up Star City and to have killed Felicity. Finally, Diggle continues to be completely out of character. I did like that Lyla (Audrey Marie Anderson) called him on it when he undermined her authority and forced her hand with the Deputy Director (David Stuart), telling him that he and Lyla were reinstating the Ghost Initiative. 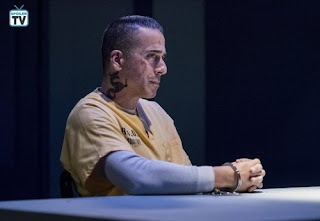 I did like them putting a bomb in Diaz’z (Kirk Acevedo) head though! Of course, does anyone believe that he won’t find a way to weasel out of it? The person putting it in his head is likely already on his payroll! All in all, this episode gets a failing grade from me. Arrow for me will always be Oliver Queen – Stephen Amell. The future storyline is not working for me – and I see no way for it to seamlessly work into the main plot the way the past storyline did. Why bring back Colton Haynes and Katie Cassidy Rogers only to keep them sidelined? What did you think of the episode? Are you enjoying what seems like just a re-boot of the original story? Am I missing something? Let me know your thoughts in the comments below!